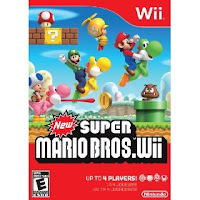 New and just released on November 15, 2009 is one of the top new video games of 2009, the New Super Mario Bros video game for the Nintendo Wii. Play solo or multi-player with 2-4 players. One great new addition to this game is that multiple players can play at the same time (no more waiting for the other person to play while you wait for your turn)! Players can play competitively or they can cooperate together. This game is rated E for Everyone. Check it out!